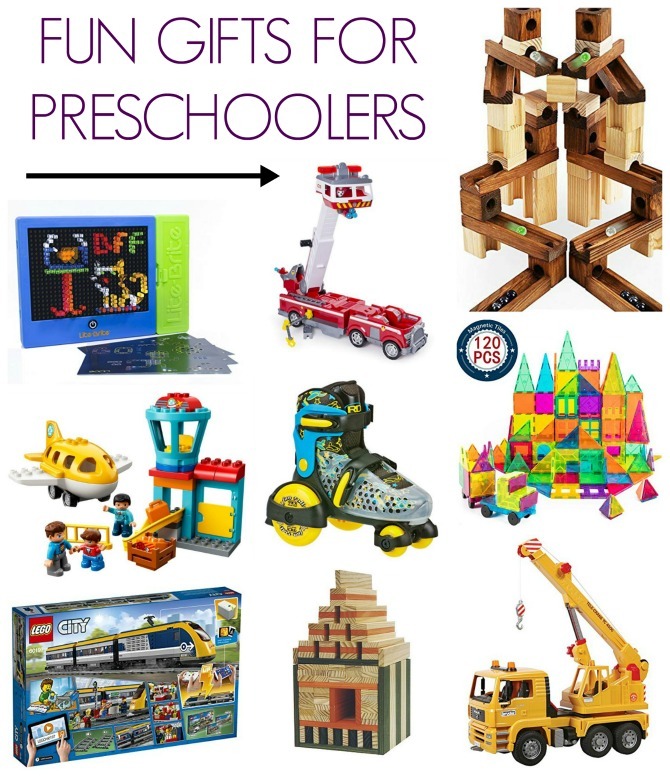 Today’s Gift Guide is my favorite—it’s all about the kiddos! This roundup of items is based on the Wish List that Charleston and I put together for him this year, with all of the items divided into Want/Need/Wear/Read categories. Charleston was particularly excited about the toys, while the books and clothing items have me feeling giddy. He’s not the baby he once was, but he’s still at an age where buying for him is a TON of fun. It will be a challenge to stick to buying him just one item from each category! If you have a young one in your life, I hope you find the ideas here helpful. 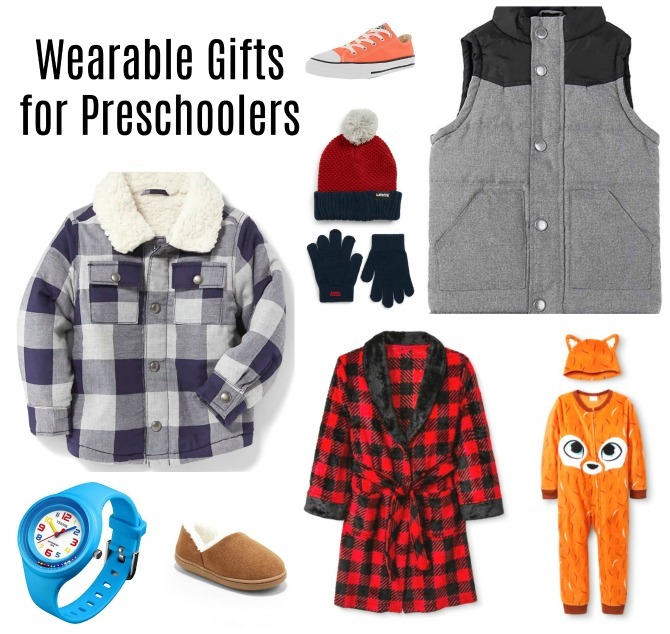 While the guide is geared towards Charleston’s demographic (almost-4-year-old boy), there are a number of items that would also work well for a girl, and many that would be suitable for younger or older kids. Lite Brite Magic Screen ~ I had a Lite Brite when I was a kid! This updated version looks a little bit safer, but just as fun. PAW Patrol Adjustable Fire Truck ~ We try to steer clear from character-themed clothing and toys, but Charleston really has his eye on this truck featuring his Paw Patrol pals, and even with the cheesy puppy figurines, it looks to be a pretty nifty fire truck. And don’t tell Charleston, but this companion boat toy is already in my Amazon cart. Classic Wooden Marble Run Construction Set ~ This marble run is gorgeous—so much nicer than the cheap plastic ones I’ve played with in the past. A great gift for future engineers (or for the sons of ads who want their kids to be engineers, like my son!). LEGO DUPLO Town Airport ~ I don’t know a single boy (or girl, for that matter) who doesn’t love a good LEGO set. The blocks in this set are a little larger than traditional LEGOs, but still feature fairly complicated building instructions. Roller Derby Jr. Adjustable Roller Skates ~ Charleston has mastered his scooter and tricycle, so I think that skates will be his next wheeled toy. These are adjustable, which means they should last him a few years as his feet grow. 3D Magnetic Building Blocks Set ~ Kids will love building with these blocks, and moms will appreciate the small foot print and easy storage. Bruder Crane Truck ~ Charleston’s good friend has a set of Bruder trucks and they are always a hit on play dates. They certainly aren’t cheap, but their sturdy construction and timeless design compensate for the higher price point. Not Pictured: Simple Board Games and Puzzles. Charleston already has a few board games that he loves (his favorite is Mouse Trap) as well as a number of puzzles, and I’d like to add to our collection. These make easy gifts that are always appreciated. 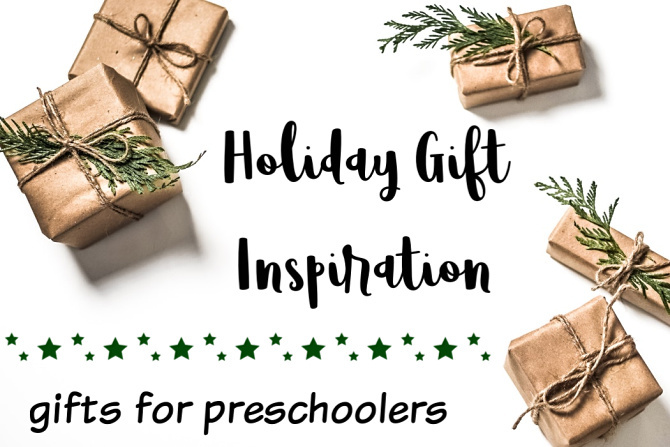 While these items are all of a more practical or educational nature, each is cool enough to be considered gift-worthy. Starter Acoustic Guitar ~ Charleston loves helping Daddy play his guitar; we’re still on the fence as to whether or not he is ready for his own, or if we should wait until next Christmas. But this would make a great gift for a mature, music-minded preschooler (and throw in some lessons for a unique experience gift). Sprout Kid Sleeping Bag ~ We’re still too young for sleepovers, but I imagine plenty of fun, negotiation-free nap times involving this playful sleeping bag and a cool blanket fort. Wooden Montessori Math Board ~ The teacher in me is more than a little excited about the educational opportunities for this item, and I sure love the streamlined design. If you’re looking for geometry-themed math toys, these pattern blocks from Melissa and Doug are another fun and educational option. Pixar Year-in-a-Box Calendar ~ Charleston had the 2018 version of this calendar, and loved flipping the page each day. Sleep Trainer Alarm Clock ~ This adorable alarm clock turns different colors to indicate Wake, Play, and Sleep times. This could prove very useful in our sleep-training endeavors. Stacking Block Coin Bank ~ This modern take on the classic Piggy Bank is a great tool for teaching kids how to budget, something Charleston is probably ready for. Bentgo Kids Lunchbox ~ Bento lunches are perfect for picky eaters. This box would work great for packing lunches, but with its perfectly sized compartments and enticing color, I can even see it working well for meals at home. LeapFrog Scribble and Write Tablet ~ We have a few other LeapFrog items, and they’ve been great for helping Charleston learn his letters. I appreciate that this tablet goes beyond letter recognition by giving kids the opportunity to write the letters themselves. Who says girls get all the cute clothes? I am LOVING every item on this list. Buying clothes for Charleston has been a surprising joy of motherhood for me; I love that Christmas gives me an excuse to get him something a little special beyond the usual tops and jeans. Converse Chuck Taylor All Stars ~ Charleston has owned MANY pairs of Converse in the last three years; as soon as he outgrows a pair, I order him new ones. They are comfortable and go with just about any outfit. I usually buy black or blue, but I’m thinking of changing things up by getting a pair in Charleston’s favorite color, orange. Levi’s Bold Beanie and Gloves Set ~ It’s supposed to be another cold winter here in Texas, so this attractive hat and gloves would be put to great use. (Not that cold weather is a requirement; Charleston loves playing dress-up with his beanies, even in summer.) These adorable animal beanies are another great hat option that any kid would love. Bienzo Quilted Sleeveless Puff Vest ~ How darling is this vest? And it looks pretty cozy, too. Sherpa Lined Buffalo Plaid Jacket ~ I’m a sucker for kids’ clothes that mimic adult wear. Luke has a jacket similar to this one, so it would be fun that they could be twins. Yeenik Kids Sport Watch ~ We bought Charleston a watch last year for Christmas and he wore it all the time, until the dog ate it (literally). I’m really liking the sturdy band and waterproof design of this one, although we’ll still need to keep it away from the pup! Cat & Jack Sherpa Lined Slippers ~ This is another item that screams Little Old Man to me. So cute, and they look quite comfortable. Cat & Jack Plaid Robe ~ Charleston has never owned a robe, but I think he’s finally old enough to appreciate one and actually leave it on. He has pajamas that match this one perfectly. Cat & Jack Orange Flash Sleeper ~ Because who doesn’t want to wear pajamas that double as a Halloween costume? Our house is full of children’s books, but there’s no way I’m holding back on picture book gifts. This list includes some books we haven’t read yet, as well as some that we’ve enjoyed from the library and would like to add to our personal collection. There are classics, some newer titles, and few collections because when it comes to picture books, more is always better. 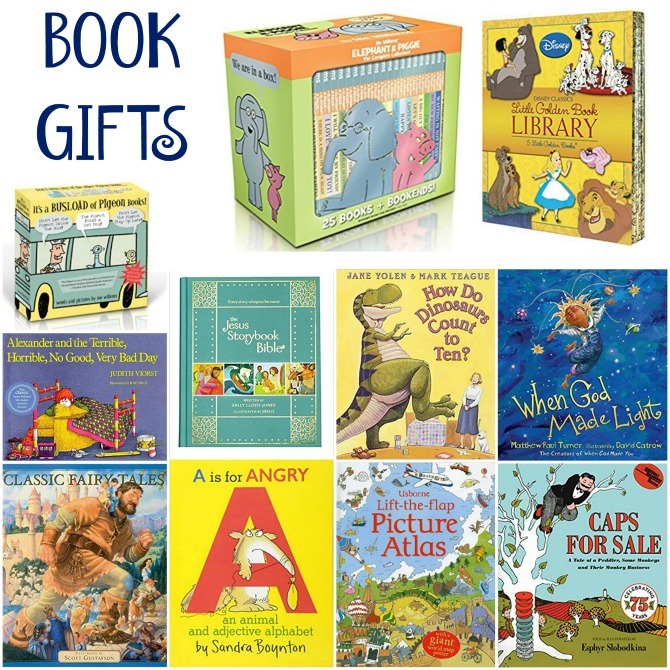 If your bookshelves are already overflowing, you could always gift an educational reading toy for this category. Elephant and Piggie: The Complete Collection ~ We’ve checked nearly all of these books out at the library and are always sad to return them. Charleston probably won’t be getting the whole set for Christmas this year, though he certainly wouldn’t mind that! Disney Classics Little Golden Books Library ~ We love revisiting our Disney friends in book form. We own several Little Golden Books (many were mine from childhood), and these would make a great addition to our collection. It’s a Busload of Pigeon Books ~ We’ve actually gifted this set to a couple of friends, but don’t own it ourselves. Charleston is a big fan of the Pigeon books since being introduced to them at the library. Alexander and the Terrible, Horrible, No Good, Very Bad Day ~ I haven’t read this old favorite with Charleston yet, but I know he will love it (and that it will provide some good discussion). The Jesus Storybook Bible ~ We have a few toddler-friendly Bibles, but I think Charleston is ready to upgrade to something more advanced. He always gets excited to read stories he’s heard in church. How Do Dinosaurs Count to Ten ~ This series is adorable, and fun for both kids and their parents. I love that they teach object lessons along with telling a nice story. When God Made Light ~ A beautiful faith-based book from the husband of famous Christian blogger/author Jessica Turner. Classic Fairytales Volume 1 ~ Some of Charleston’s favorite books have been the classic fairytales; this lovely volume features ten beloved stories. A Is for Angry: An Animal and Adjective Alphabet ~ Charleston might be aging out of most of the Sandra Boynton books, but alphabet books are always a hit! Lift-the-Flap Picture Atlas ~ We’ve been really enjoying Lift-the-Flap books lately. They are great for quiet time and long car rides because Charleston can look at them on his own. This one features maps, which have been a big topic of interest in our home lately. Caps for Sale ~ This is another classic we don’t own, but would like to. 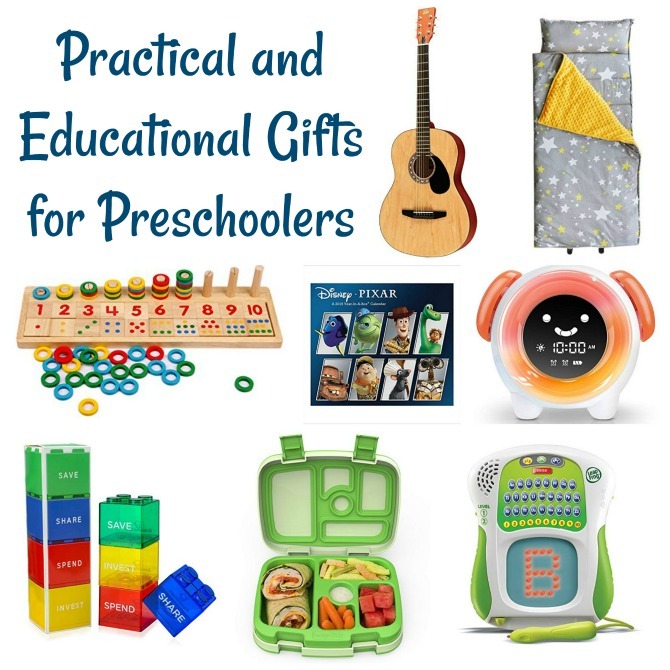 If you are looking for more gifts for preschoolers, check out last year’s gift guide. 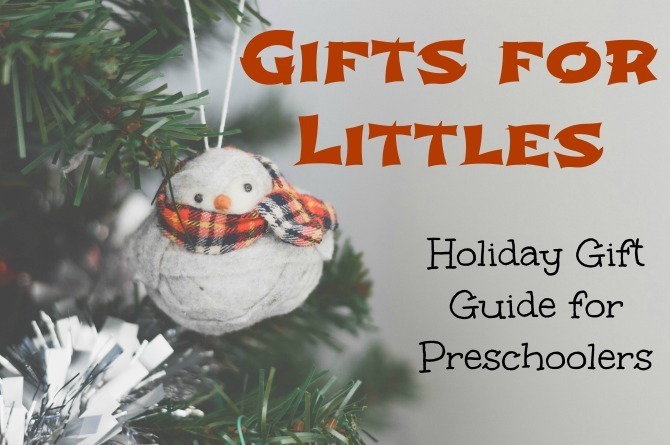 That link will also point you toward previous Gift Guides I’ve made for toddlers and babies. I hope you’ve enjoyed these Gift Guides; I had so much fun putting them together! If you happen to buy any of the items I’ve shared, let me know about it, I’d love to hear who you buy for and how much the recipient loves their gift!